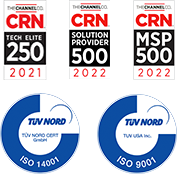 As an endpoint security provider for the next generation, Carbon Black has pioneered new technology for application control, endpoint detection and response (EDR), and next-generation antivirus (NGAV). When you combine Carbon Black with Zones' security expertise, you get solutions capable of defending against advanced cyber threats such as malware, ransomware, and non-malware attacks. Ready to take your endpoint security to the next level? Contact your Zones account manager or call 800.408.9663 today to learn more. The Cb Predictive Security Cloud (PSC) is Carbon Black's converged endpoint protection platform delivering next-generation security services through the cloud. By collecting and analyzing unfiltered data from millions of protected endpoints, the PSC is able to make predictions about, and protect against, future and unknown attacks. The PSC sends all endpoint data to the cloud to be analyzed, uniquely allowing it to predict never-before-seen threats. Using event stream processing, the PSC continually identifies threat patterns that are invisible to other solutions. Simple, cloud-based console makes it easy to add new capabilities at any time to stay ahead of emerging trends. Cb Defense offers next-generation antivirus and EDR together in one cloud-delivered platform. Together, it stops ransomware, commodity and advanced malware, and much more. Cyberattackers are innovating faster than traditional security, but they've met their match in Cb Defense. This solution uses advanced predictive models to analyze complete endpoint data and uncover malicious behavior, allowing you to stop threats before they compromise your system. Cb Defense captures data from every endpoint, analyzing each event stream in context to uncover emerging attacks that other solutions might miss. Industry-leading detection and response capabilities reveal threat activity in real time, so you can respond to any type of attack as soon as it's identified. Traditional antivirus lags behind emerging attacks and requires too much manual effort to stay effective. With Cb Defense, you can automate operational tasks and integrate with your existing tools to boost the whole team's productivity. Carbon Black integrates with VMware AppDefense. The resulting combination delivers advanced threat detection and in-depth application behavior insight, letting you stop attacks in progress and accelerate your response. Native and bi-directional integration protects both applications and infrastructure within the software-defined data center. This combined solution is an all-new, best-of-breed security posture that enforces "least privilege" around applications while leveraging streaming analytics to stop attacks at any stage of the kill chain. The integrated data populates crucial attack details throughout the user interface, equipping analysts with the information they need to take the right action at the right time. Cb ThreatSight is a managed threat-hunting service staffed by a dedicated team of experts who keep watch over your environment and notify you of emerging threats. It offers expert threat validation, an early warning system, and a roadmap for tracking down the root cause of vulnerabilities. You can lock down servers, critical systems, and fixed-function devices in highly regulated environments with Cb Protection. You'll get extreme protection, continuous compliance with regulations, and high performance for little ongoing effort. This highly scalable, real-time EDR solution offers unfiltered visibility for top security operations centers and incident response teams. Cb Response allows you to proactively hunt threats before they have the chance to strike. Real-time endpoint query and remediation solution for security operations that enables organizations to ask questions of all endpoints and take action to remediate in real time. Security and IT Operations teams often have no reliable way to assess the current state of endpoints across their enterprise, leading to increased risk of breach, inability to make informed remediation decisions, and unnecessary spending on infrastructure maintenance. Cb LiveOps closes the gap between security and operations, allowing administrators to perform full investigations and remote remediations all from a single cloud-based platform.